AIPU Solids Control is one of the leading manufacturer for solids control system, one set of 1000HP rig solids control system is under building in factory and will be ready for delivery before China spring festival. The whole system contains 2 sets of screen vibrating shale shaker, 1 set mud cleaner with desander and desilter cyclone, 1 set of decanter centrifuge, 5 sets mud tanks, centrifugal pump for feeding mud into cyclone and mixing mud, mud agitator and mud gun inside of mud tank. 1000GPM mud flow capacity by 2 sets of vibrating shale shaker at 40 mesh shaker screen by 2 sets of vibrating motor at maximum 7.5G G forth. 4 panels of shaker screen installed on each shaker at 2.73 square meters screen area. 1000GPM mud flow capacity at mud cleaner with 2 sets of 10 inch desander cyclone and 12 sets of desilter cyclone at 20 micron separation points. The desander and desilter cyclone installed on a frame with inlet and overflow pipeline fit on top of a shale shaker. 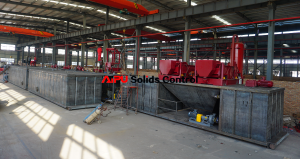 5 sets of mud tank for mud recycling, intermediate storage, active and mud mixing. Shale shaker tank sit at the end with shale shaker and mud cleaner installed, centrifuge tank sit beside and then following 2 sets of mud storage tank and 1 set of mud mixing tank. 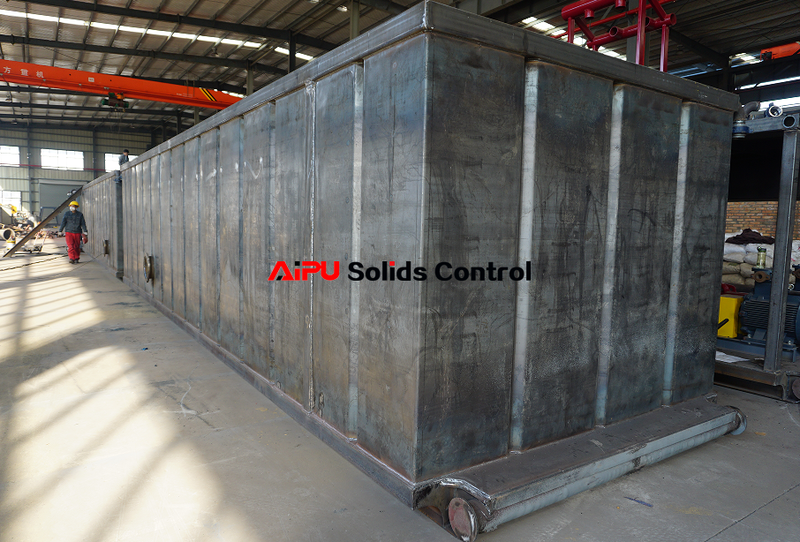 AIPU supply different size of solids control system for different size of oilfield drilling rig. The mud tank size and quality is customized by different requirement of mud tank capacity. Each mud tank is divided into several mud tank compartment depending on mud process designation.